The National Chicken Council calculates that about 1.25 billion chicken wings will be consumed this Sunday, February 1, when much of America will be watching the biggest football game of the year. The chicken industry has bred chickens to be up to three times bigger than they used to be, but that weight means they often can’t walk without pain, never mind get off the ground easily. Slower-growing, healthier chickens can perch and even fly up into low branches of trees. Imagine a football field full of chickens, from one end zone to the other. This is what a typical industrial chicken shed on a factory farm is like: Tens of thousands of birds are packed into giant, windowless structures, living in their own waste. This causes open sores on their chests and feet that can act as gateways to infection. With often less than one square foot of floor space each, birds have no ability to perch, forage or even move easily. It doesn’t have to be this way! The ASPCA’s Truth About Chicken campaign is encouraging companies to use more humane practices to finally address the suffering stemming from unnatural growth rates and poor conditions. 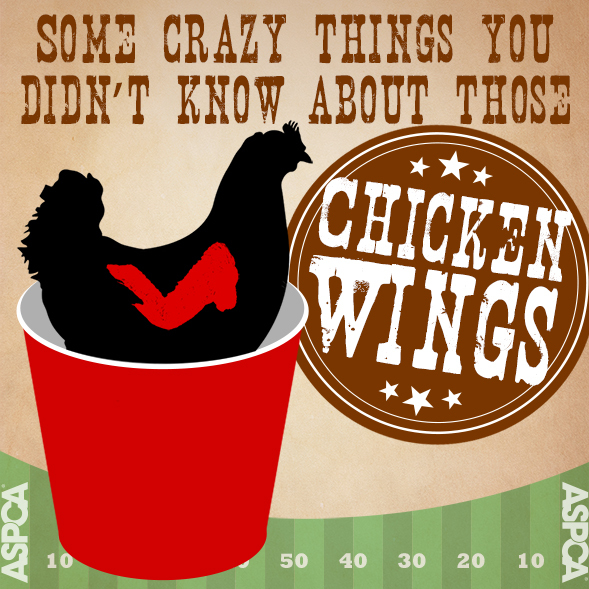 In the meantime, if you do plan to purchase wings, look for products bearing trustworthy labels that represent better animal welfare standards, like Certified Humane, Animal Welfare Approved and Global Animal Partnership. Certified farms such as White Oak Pastures, Crystal Lake Farms and Mary’s Chicken specialize in breeds with more balanced growth and offer birds much more space to move, enrichment and outdoor access. If you’d like to see more humanely raised chicken in your local store, please fill out an online supermarket request form at TruthAboutChicken.org.